The is the story of two strong women, Caroline MacAfee, a skilled carpenter, and her daughter Jamie, a talented architect. The day after her 56th birthday, Caroline is told the network wants Jamie to replace her as the host on their family-based home construction TV show. The resulting rift couldn’t come at a worse time. For Jamie, life changes overnight when, soon after learning of the host shift, her father and his new wife die in a car accident that orphans their two-year-old son. Accustomed to organization and planning, she is now grappling with a toddler who misses his parents, a fiancé who doesn’t want the child, a staggering new attraction, and a work challenge that, if botched, could undermine the future of both MacAfee Homes and Gut It. For Caroline hosting Gut It is part of her identity. Facing its loss, she feels betrayed by her daughter and old in the eyes of the world. When her ex-husband dies, she is thrust into the role of caregiver to his aging father. And then there’s Dean, a long-time friend, whose efforts to seduce her awaken desires that have been dormant for so long that she feels foreign to herself. 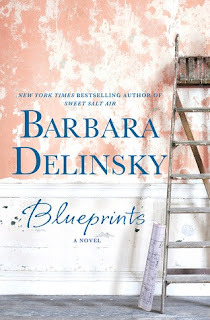 Both women ask, as the blueprints they've built their lives around suddenly need revising. While loyalties shift, decisions hover, and new relationships tempt, their challenge comes not only in remaking themselves, but in rebuilding their relationship with each other. 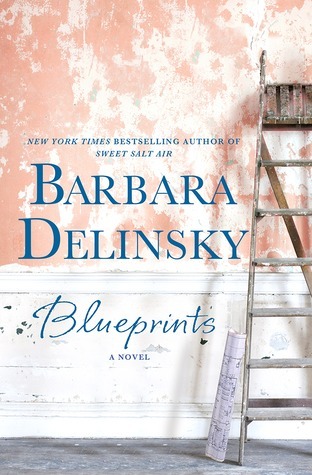 Blueprints by Barbara Delinksy was a thoroughly enjoyable read, and as soon as I read the opening pages I was hooked. Both Caroline and Jamie are smart, competent women, each very talented at what they do. Caroline is thrown by her possible axing of being the host of the home makeover show Gut It. She senses it's because of her age that Claire the snarky director is wanting to replace her with the younger Jamie. This creates tension for Claire, she is very good at what she does, yet it would be her daughter who would replace her. She loves Jamie and they have always been there for each other. Suddenly their relationship is strained and Caroline finds herself at odds with her daughter. Jamie loves her mother, has been thrown by the sudden responsibility of caring for her step baby brother when he loses both his parents in a fatal car accident. She then finds Brad, the man she is about to marry, isn't keen on having a ready made son in the mix. She meets a local at the park, a Dad with a son just a year older than Tad. He seems to offer support and a whole lot more that Jamie soon appreciates. Life becomes very busy for both women, it seems like their relationship is strained for ages, although in actual time it is not really that long. Each one finds herself in a new situation, dealing with issues that are so important for them. With the support of the men who love them, each one finds her way through the maze to something new and satisfying. Love for family, the bond between a mother and daughter, the enjoyment of passionate love with a strong partner, strong women competent at what they do, all combine in this book to make it a downright pleasurable read. Elizabeth over at Thoughts From an Evil Overlord has a giveaway for two copies of this book for USA residents. Hop on over and enter. Well worth the win and the read. Blueprints review and giveaway. Hey! My review went up today, too! How funny is that? I have a giveaway, U.S. only for 2 copies, if you want to add a mention and link in your post. I've been curious about this one just based off the cover and it sounds like it's a good read. I love books involving families and finding your footing and the fact that there's some DIY involved is a bonus! I haven't read this author in quite awhile. This book sounds like a great way to get reacquainted. This sounds like an enjoyable read. I'm going to check out Elizabeth's giveaway. Thanks for a great review. Sounds good. Even though I have a couple of her books on my bookshelf, I don't think I've actually read one *sigh* ... hopefully one day lol. I have enjoyed Barbara Delinsky in the past but haven't read her in awhile. This one sounds like a fun story line for the summer. Thanks for your review.